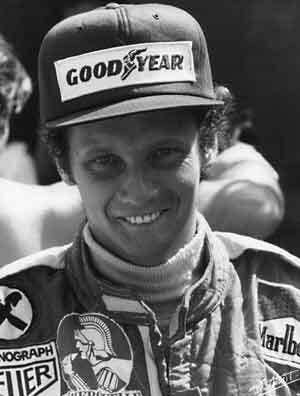 Niki Lauda presents many images to race fans the world over. He is The Man Who Came Back From The Dead, following his astonishing recovery from the fiery accident in the German Grand Prix of 1976 that so nearly killed him. He is The Rat to those who remember the contretemps with fearless paratrooper David Purley during the Belgian Grand Prix in 1977. He is a triple World Champion. The man who advised Ferrari in his retirement. The man who quit racing to start his own airline, and came back to win again. Lauda is all of these men, and more. Even Nigel Mansell displayed greater potential than him in the nursery formulae, and when the bucktoothed Austrian used family credit to buy himself an F1 ride with March for 1971, most happily wrote him off as a complete no-hoper. March's engineers and managers, among them Max Mosley, later the president of the FIA, barely listened to him when he told them that their car didn't work. Yet within two years Lauda was impressing with BRM, and by 1974 he was winning races for Ferrari, the new hot shoe grabbing at Jackie Stewart's vacant crown. Lauda lost the 1974 title through lack of experience and his own impetuosity, but won it conclusively in 1975. He was leading the fight again in 1976 before the accident at the daunting Nurburgring left a priest administering him the last rites, and he still only lost it by a point at the final race. In 1977 he retrieved his crown in style. While the press romanticized his remarkable recovery, Lauda remained the supreme pragmatist. He was once told that an historical book did not credit him with starting the race which nearly killed him, because it required a restart. "So, what happened to my ear then?" he jocularly demanded to know. He lost that year's title because he pulled out of the Japanese GP at Fuji. He said his still-healing eyes were having trouble seeing adequately in the terrible conditions. Ferrari slated him for it, but his decision not to race then was as independent and as brave as his decision to return to the cockpit only six weeks after his accident had been. He left Ferrari for Brabham Alfa Romeo at the end of 1977, and quit the sport altogether with a sudden announcement of retirement in Canada in 1979. He set up his own airline, LaudaAir, but returned to racing with McLaren in 1982. And he started winning again as if he had never been away. Two years later, his sheer speed now honed by the canniness of an old campaigner, he won his third title when he beat McLaren teammate Alain Prost by half a point. It was the narrowest margin of title victory ever. Lauda quit for good at the end of 1985, built up his airline further, then acted as an advisor when his old friend Luca di Montezemolo took back the reins at Ferrari in 1992. He brought his unique brand of cynicism and brutal analysis to bear in this consultancy role, and remained as outspoken as ever. Jaguar then concentrated on his airline, which was in difficulties again until he lost control of the business. In February 2001 he was named by Wolfgang Reitzle as the head of the Ford Motor Company's Premier Performance Division, which included Jaguar Racing and Cosworth. This resulted in a clash with Jaguar Racing boss Bobby Rahal and from the middle of 2001 Lauda was effectively running Jaguar as well. But the shifting sands of Ford politics caught him out. Reitzle left the company early in 2002 and Lauda was ousted at the end of the 2002 season. Ever since the fire at the Nurburgring, Lauda has worn the scars without flinching, facing the new circumstances of his life with the practicality and dark humor he had always brought to his racing. They conceal a razor sharp, computer-like mind - and the relentless determination that won him three titles. He continued to operate the airlines Lauda Air before selling it to Austrian Airlines in 1999. He started the new airlines Niki in 2003. Lauda got deeply involved in F1 in 1993 as a consultant for Ferrari. He then joined Ford's Jaguar F1 program and became team principal in 2001 replacing Bobby Rahal. But a major purge saw Lauda and a number of other senior team members forced to leave the team after the 2003 season. As outspoken as ever, Lauda became a regular on the Formula 1 season as a commentator for German TV. He also became a non-executive chairman for the Mercedes F1 team in September 2012. He became a valued member of the team thanks to all his experience.